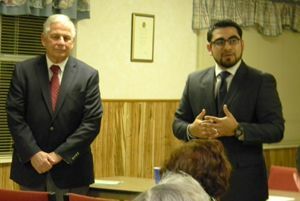 NORTHEAST – Congressman Gene Green met with the North Houston community last Tuesday to update them on Congress’ activities. He answered questions and listened to community concerns. Also attending the Town Hall session was state representative Armando Walle. Congressman Green said that for the first time in 4 years, the budget was established in December right before Christmas. And by the middle of January, Congress passed a comprehensive budget bill. He explained that it was a give/take; and some things he does not like were passed as well as some things he likes. Representative Armando Walle also attended the meeting and said that “sometimes you have to compromise” to be able to get your bill passed; a bill in favor of the community he represents. -Transportation bill; 2 billion dollars out of the rainy day fund. -Statewide water project, which takes another 2 billion dollars out of the rainy day fund. Rep. Walle said they are working on implementations of the bills that did not pass and even the ones that passed before the next legislation. Another public concern Rep. Walle mentioned is the expansion of I-45 where public input is needed from “business owners and other people that may be affected by expansion or acquisition of certain properties that would be taken over basically by the state to expand I-45.” With this, business owners are concern that they may be out of business. Rep. Walle encourages all the community and specially those that will be affected, to submit their comment by January 31, 2014 either to his office or to TxDOT. Finally, Congressman Gene Green is working on the expansion of federally qualified health centers in the community like the Vecino Clinic, which is based at Denver Harbor but they have a satellite location on Airline, north of Tidwell. And they are looking to expand in the Greenspoint area and on 59 and Hardy, said Rep.Walle. According to Congressman Green, this is his major concern because Texas has the highest percentage rate of uninsured people. Questions from the audience included pollution from China affecting United States, regulations and control on Internet usage by providers, and environmental clean-up. 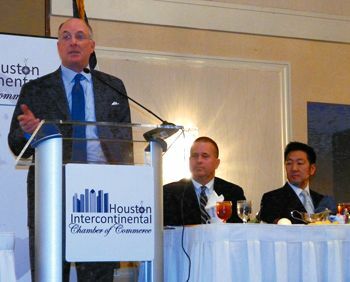 GREENSPOINT – The Houston Intercontinental Chamber heard from some industry experts at last Thursday’s Economic and Energy Forum. The event was held at the Sheraton Hotel on JFK Boulevard, with about 90 persons attending. Featured speakers at the luncheon were Ken Fisher, CFO of Noble Energy, and two FBI agents from Washington, Douglas Thompson and Michael Huan. These agents specialize in what is known as the FCPA act, or Foreign Corrupt Practices Act. In other words, they are charged with stopping or prosecuting the practice of winning contracts by paying illegal bribes. Fisher spoke about the new technology in the oil and gas business, and how it has changed the Energy picture for the United States. This technology is a combination of oil and gas extraction through a process known as “Hydraulic Fracturing” and horizontal drilling techniques. Fisher explained that this was not really new technology, having been known and used since 1947, but had come into favor in the last few years. The combination of fracturing with horizontal drilling is what has made this method successful, he said, and much of that success can be attributed to Houston oilman George Mitchell. It is being used in several major fields in the United States, namely the Marcellus field in Pennsylvania, the DJ Basin in Colorado, and in Texas the Eagle Ford, Bakken, and Permian Basin Fields. Due to the high level of production, Fisher said that by 2016 or 2017 the United States will be the world’s biggest producer of oil, topping Russia and Saudi Arabia, who are now number one and two. Fisher spoke about the concerns people have about environmental contamination from this method of hydraulic fracturing. He went to great lengths to explain that it can be done safely, and if done correctly there is no danger. He demonstrated through illustrations how his company, Noble Energy, applies industry “best practices” to their drilling to avoid environmental impacts. Ironically, as he spoke, many people in the lobby were reading the day’s copy of USA-TODAY, with a front page article about the oil boom, and how it “poses risks to health and safety” and concerns people throughout the country, especially when they are near active drilling sites. In a related talk, the FBI agents explained how paying bribes in foreign business deals is illegal, and not acceptable to the U.S. authorities. They are charged with finding, stopping and prosecuting companies that are willing to do business with bribes. The U.S. has passed the Foreign Corrupt Practices Act to deal with this problem. Michael Huan said these tend to be in the Energy, metals and mining, and technologies industries. EAST ALDINE – Harris County Attorney Vince Ryan is seeking a court order to ban members of the Crips and the Bloods gangs from entering or committing crimes in a north Harris County community. Ryan is asking a judge for an injunction forbidding 37 members of the Bloods and 17 members of the Crips from being present in the East Aldine Safety Zone. 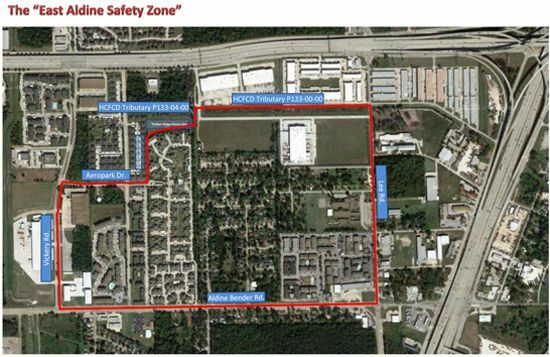 The East Aldine Safety Zone is 217 acres or about a third of a square mile to the east of Highway 59 and south of Bush Intercontinental Airport. The Safety Zone contains two schools (Francis Elementary and A&W Academic Academy), apartments, restaurants, a residential community, and retail stores. The map can be viewed at http://www.harriscountytx.gov/cmpdocuments/caoimages/EastAldineSafetyZone.pdf. Ryan worked with the East Aldine Management District in the preparation of the court petition. He won a similar injunction last year against other members of the Crips and Bloods that banned them from the Brays Oaks Safety Zone in southwest Houston. The County Attorney’s petition states that the defendants have been regularly engaging in gang activities in this community including weapons offenses, criminal trespass, possession of illegal substances, making terroristic threats and graffiti. The petition asks that the gang members be banned from being physically present in the Safety Zone, as well as forbidding their possession of materials for graffiti and communications devices including cell phones and prohibiting wearing clothing that identifies them as gang members while in the Zone. The East Aldine Safety Zone includes the Haverstock Apartments. Haverstock had been rife with gang activity before the district attorney obtained a similar court order in 2010 banning gang members from what was called “the most dangerous apartment complex in Harris County.” Living conditions improved dramatically after several gang members were arrested and sent to jail for being at the complex. Derrick Ford wasnt the biggest guy on the field for the MacArthur Generals during the 2013 season, but he sure played big in leading his team to a 5-5 season that saw the Generals come within one game of landing a playoff spot. Ford, a senior, rushed for a team high 1,239 yards and scored 13 touchdowns. He also added eight receptions for another 42 yards. His performance during the 2013 season earned him the Northeast News Offensive Player of the Year honors. Fords coach, Andy Garza, said the 5-7, 180-pounder did an excellent job not only on the field, but also in the locker room. The Generals lost starting quarterback Doug Steed for the season when he suffered a knee injury the week before the season began. Garza knew he needed someone to step up on offense and become the vocal leader of the unit, and he found his man in Ford. Ford was a three-year varsity letterman and a two-year starter. As a junior, he rushed for 299 yards and two touchdowns, but stepped up his game as a senior as he became one of the leading rushers in District 18-5A. Ford broke a couple of long runs during the season, the first was a 68-yard touchdown run against Galveston Ball that carried the Generals to victory, and the other came against Nimitz, where he again went 68 yards for a touchdown. Ford only began playing football his freshman year. He said hes always loved watching football, and decided to give it a try himself when he arrived at MacArthur Ninth Grade School four years ago. Garza is hoping Ford gets the chance to continue playing. Hes received some interest from Navarro College, Trinity Valley College and Midwestern State University. Ford said hed like to major in math in college and is thinking about entering the teaching profession in the future. Garza said he believes if given the chance, Ford could compete at the next level and be a positive influence at the collegiate level. Heres hoping Derrick Ford gets to do some special things at the next level. John Johnson isnt a big talker, but when youve made as many big hits and plays as he has over the last three years, he didnt need words to get his message across to his teammates and opponents. Johnson, a senior linebacker at Eisenhower High School, was a three-year starter for the Eagles. As a sophomore, he was named the District 18-5A Newcomer of the Year and as a senior was named the leagues Defensive Player of the Year. 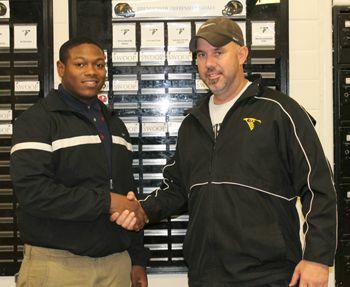 He was also a first-team all-district performer three straight years. During his senior season, the 5-10, 215-pounder 95 tackles, 15 tackles for loss, four sacks, one interception, recovered three fumbles and returned one fumble for a touchdown. In addition to being honored by the District 18-5A coaches, he was also named the Northeast News Defensive Player of the Year for his outstanding senior season. 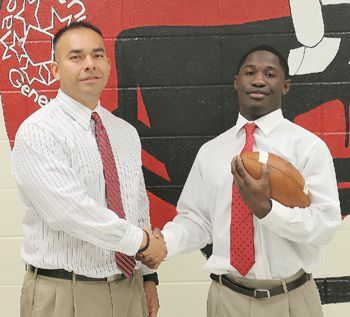 First-year head coach Kerry Bamburg said it was nice to have him on his side after having to compete against him for two years when he served as the defensive coordinator at Aldine High School. Johnson isnt tall, but Bamburg said his play reminds him of a couple of other vertically challenged middle linebackers, Sam Mills and Mike Singletary, who did OK in the NFL. Bamburg regrets that he only had the chance to work with Johnson for one year, but said he hopes he gets the chance to play at the next level. The first-year head coach said Johnson will probably go the junior college route and his play will hopefully catch the eye of some Division 1 schools in the near future. His kind dont come around often and it makes it tough on a program when guys like John leave, Bamburg said._Eric Jackson, Eisenhowers defensive coordinator, said Johnson was a natural middle linebacker. Jackson knew Johnson was a player early in his career at Eisenhower. Jackson knows a thing or two about the linebacker position. He played linebacker in college at Nichols State with former Houston Oilers Johnny Meads and Jay Pennison. He believes Johnson can play at the next level and hopes he gets the chance to do so. And looking at his statistics, Johnson accomplished quite a bit over the last three years at Eisenhower. NORTH HOUSTON  METRO threw a party and hundreds or even thousands of Houstonians showed up for a good time, and to try out the new light rail transit system that open on Saturday, December 21. Rides were free all day, and in addition, METRO had lots of events at Moody Park, a half-way stop on the line toward downtown, to entertain and inform the public about transportation options. Wet weather put a slight damper on the day-long festivities, but METRO planned for this with complimentary umbrellas, a covered pavilion for the concert, exhibits in tents at Moody Park, and lots of attendants and police present to direct pedestrian and vehicle traffic for everyones safety. The new Red Line, as the north extension is named, will provide easier access to downtown, and some think it will attract riders from downtown to the shopping and neighborhood stores in the Northline area. It is also expected to spur further development on the Northside, along Fulton where it runs, but also further north on Airline, North Freeway, and more. In fact, when TxDOT begins reconstruction of the North Freeway, it may be the only good link to commute to the city center. 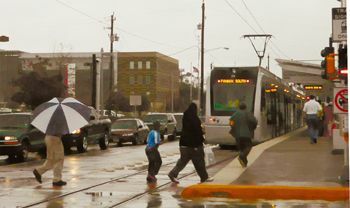 The new rail line runs 5.3 miles, joining the existing line at the University of Houston Downtown campus on Main Street. The total mileage is now about 13 miles, but next year two more lines will open to the East end, providing even more options. Now, workers can use the line to reach jobs in downtown or the medical center, and sports and public shows at Reliant Center. Total travel time to downtown is about 20 minutes. There are 8 stops between Northline Transit Center, and UH-Downtown. The Red/North line took 4 years to build, and cost $756 million to build. Among the booster of the new line are Jeff Procell, general manager of Northline Commons, and Rebecca Reyna, executive director of the Greater Northside Management District. Procell says that he can forsee shoppers travelling north on the line, to access Northline Commons store, the only major retail center on the line, including downtown. Reyna thinks the line will be a catalyst for further development in the northside, and her organization has been introducing developers and businesses to the potential. Procell said that his center has been working with METRO for almost 20 years to make available land for the transit center on Fulton, near HCC-Northline, Walmart, the Post Office, and his center. Metros president, Tom Lambert, said that after the first week of ridership, they were very encouraged by the number of boardings and the general acceptance of the line in the community.